Pandaw II looks like a big toy boat but is in fact a luxurious yet unostentatious replica of a colonial-era vessel dating from 1865. 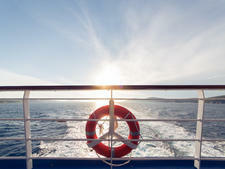 It has a covered sun deck and two passenger decks with 24 cabins of 170 square feet. All have twin beds, air-conditioning and French windows with a table and two wicker chairs outside on the walk-around deck. Bathrooms have good showers, bathrobes, hair dryers, and slippers are provided. Cabins also have desks and safes. There is an onboard laundry and crew clean shoes after excursions. Passengers spend their leisure time on the sun deck, where they can take in the sights from teak loungers and get drinks from a bar. The upper deck also has a viewing area forward and an air-conditioned bar. There is an open-bridge policy. Meals are served in the main deck restaurant, with large, floor to ceiling windows. Breakfast is buffet style but preceded by coffee, tea and light bites on the sun deck for early risers. Lunch is served either buffet style or standard sit-down, while dinners are four-course affairs. Produce is fresh, regional and seasonal. Coffee, tea, soft drinks, beer and domestic spirits are complimentary. There is Wi-Fi, which is often slow due to the remote areas traveled. However, guides can help find Internet shops in some of the riverside towns. Pandaw II has two guides who give briefings at cocktail hour every night, and accompany all excursions, which are daily and free. Some local entertainment is offered, such as folkloric dancing and puppet shows. Tipping is optional. Overnights usually involve stopping at a riverbank and securing the ship with lines attached to stakes hammered into the sand. Sometimes part of the gangway is little more than a plank and sandbags, making this a difficult trip for those with disabilities. But plenty of willing crew hands are always there to assist. 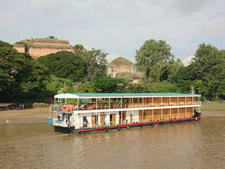 Most passengers see Pandaw as a world away from conventional cruising and take such measures in stride. Kalay Pandaw is a handsome little vessel aimed at private charters for just 10 passengers, two of whom can share a spacious owner suite. 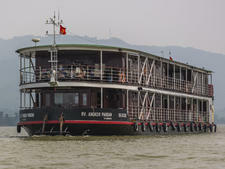 Kindat Pandaw's shallow draft allows it to cruise from Mandalay to Bhamo, the most northern navigable point of the Irrawaddy, close to the China border. 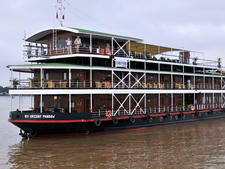 After it was outfitted as a floating clinic as part of relief efforts following Cyclone Nargis, Zawgyi Pandaw relaunched as a river cruiser in 2014. 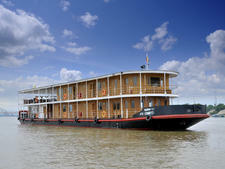 Mekong Pandaw is decorated in the colonial style, finished in brass and teak. Cabins are all 168 square feet, with panoramic French balcony windows. Kalaw Pandaw's shallow draft allows it to cruise from Mandalay to Bhamo, the most northern navigable point of the Irrawaddy, close to the China border. 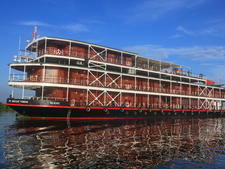 The six-cabin Angkor Pandaw is a handsome two-deck riverboat, a luxurious yet unostentatious replica of a colonial-era vessel dating from 1865. 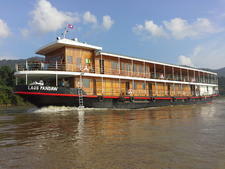 Tonle Pandaw is a handsome four-deck riverboat, a luxurious yet unostentatious replica of a colonial-era vessel dating from 1865; it sails in Asia. The 30-cabin Orient Pandaw looks like a big toy boat but is in fact a luxurious yet unostentatious replica of a colonial-era vessel dating from 1865. 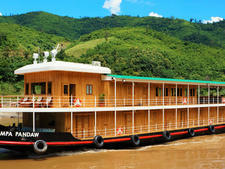 The 30-cabin Indochina Pandaw looks like a big toy boat but is in fact a luxurious yet unostentatious replica of a colonial-era vessel dating from 1865. 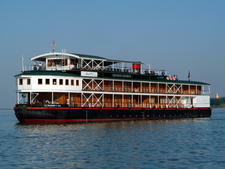 Katha Pandaw is a small vessel with a shallow draft that enables it to cruise the Irrawaddy beyond Mandalay, and hard-to-reach sections of the Chindwin River. 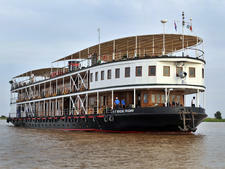 A 131-foot long, two-deck riverboat, Yunnan Pandaw has operated on the Upper Mekong River since September 2016. 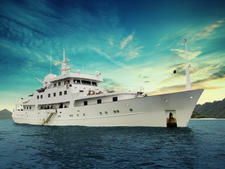 Joining the Pandaw fleet in 2016, Andaman Explorer began life as a Norwegian coast guard vessel and was most recently owned by a Dubai shipping family. 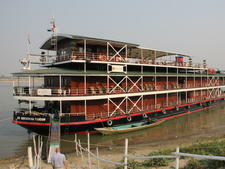 Bassac Pandaw, which sails in Asia, is a handsome four-deck riverboat, a luxurious yet unostentatious replica of a colonial-era vessel dating from 1865. 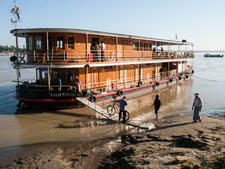 Kha Byoo Pandaw's shallow draft allows it to cruise from Mandalay to Bhamo, the most northern navigable point of the Irrawaddy, close to the China border. 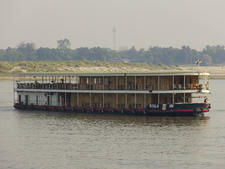 The 17th ship in the Pandaw fleet, Sabei Pandaw continues the tradition of classically styled river cruisers for which the line is known. 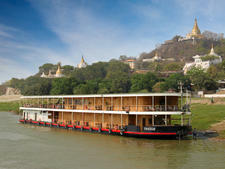 The only ship that visits the three countries of the Golden Triangle (Laos, Thailand and Myanmar) and China on its Upper Mekong River itineraries.